LCD display or from the PC . 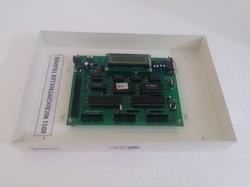 8085 is equipped with powerful software monitor in 27C128 EPROM. 16KB powerful software monitors 27C128 EPROM. Three 16 bit programmable timers from 8253/8254. 48 Programmable I/O lines from two nos. of 8255. 50 Pin FRC connector for system bus expansion. 20 pin FRC connectors for user interface from 8255. 9 Pin D type female connector for RS 232C interface and 9 Pin. Six numbers of selectable baud rates from 150 to 9600. 101 PC type keyboard for entering user address/data and for commands. Built in line-by-line Assemble and Disassemble. Facility to connect to PC.